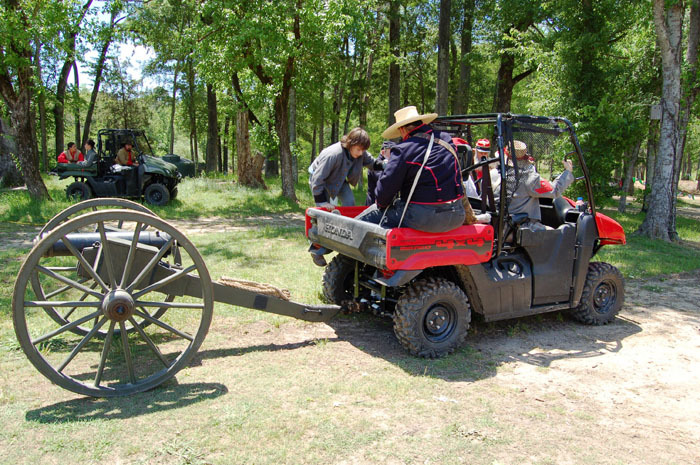 We have an unique way of moving cannons from your camp site to the battle field. Historic Jefferson Railway and Diamond Don RV Park are sponsoring the Great Locomotive Chase, May 3.5, 2019.. Colonel Jim “Pimp Daddy” Lyons is the overall military commander of this event and will be Commander Control on the field. There will be an officer’s meeting at the Diamond Don RV Park, 1602 State Hwy 49 East, at 3:30 on Friday, May 3, 2019 at Neeley’s Roughneck’s Headquarters. All weapons will be inspected before the first gun fires. Obviously, no live rounds are allowed on the premises. Big guns will receive an allotment of 20lbs. of cannon powder, smaller guns will receive 10 lbs. Muskets will receive 1 lb. of powder. Please contact us to let us know you are participating in the battles so that we can arrange to have the right amount of food and powder. Click here to send us an email. Francene Rainey, 903-445-9796, and Melissa Moit, 903-742-2041 are the logistics coordinators for the event. General questions about the event, registration, food, etc. can be directed to Francene or Melissa via phone, or email. Reenactors can contact Colonel Jim Lyons for questions regarding weapons inspection, officer’s meeting, and battlefield logistics. Jim can be reached at 409-504-3001. The battles will take place as the train stops along the river in the RV Park. The train will depart the depot in downtown Jefferson on Saturday, May 4 at 11:00, 12:30, 2:30, 4:00 and 5:30; and on Sunday, May 5 at 12:30. The train will stop on its way out to the RV Park at the Battlefield for about 5-7 minutes for a skirmish. Then the train will continue out of the RV park, turn around and come back. It will stop again at the Battlefield for another 5-7 minutes for a skirmish. Reenactors can engage for a longer period at their discretion. The Virginia, a replica ironclad with five working cannons, joins the skirmish as it fires its cannons from the banks of the Big Cypress Bayou River. Registration is $10 per person, civilian or military, children under 8 free and will take place at Diamond Don RV Park. Reenactors participating in the Great Train Chase and Train Battle of Port Jefferson camp free in the period section of the Diamond Don RV Park with lots of space, trees and plenty of amenities including free WIFI, water, hay, split wood, restrooms, showers and RV dump station. Registration includes noon day meals on Saturday and Sunday; and Saturday evening supper and ball. All reenactors are welcome to this event: civilians, military individuals and units, both land and sea. There is a registration fee of $10.00 for reenactors – which will include a lot of extras.. Historic Jefferson Railway will be hosting supper Saturday evening at 7:00 in the Diamond Don Event Center at Diamond Don RV Park for all reenactors registered for The Great Locomotive Chase. For your entertainment, there will be period music along with call dances. You won’t want to miss this exciting evening. DRESS CODE for supper and ball: Come as you are – go casual or complete Period Ball attire – all registered reenactors welcome. .
Free Camping and Amenities – participation in train battles on Saturday and Sunday is required. Reenactors participating in the Great Train Chase camp free in the period section of the Diamond Don RV Park with lots of space, trees and plenty of amenities including free WIFI, water, hay, split wood, restrooms, showers and RV dump station. Registration includes noon day meals and Saturday evening dinner and ball. RV sites with water and electric are available to participants in Great Train Chase on a first come, first served basis, for $20 night. Reservations are recommended. Click here to send an email requesting an RV site. We are actively seeking individuals and groups to participate in our Day of Learning, on Friday, May 3, 2019, for school groups. Living History is sponsored by the Marion County Chamber of Commerce, to draw attention to the history and romance of the Civil War way of life. The Living History Camps will demonstrate Camp Life and Military Activities and includes a train ride aboard the Historic Jefferson Railway as the story of The Andrews Raid unfolds alongside the Big Cypress Bayou. If you are interested in participating, click here to send us an email. Last year, we had almost 1000 students attend.